Allergies – What Lies Beneath the Surface? Addressing allergies begins with recognizing that the allergen is a triggering factor to an over-reaction of the immune system. According to Biological Medicine principles, this reaction is an indication of a severely disturbed internal milieu, compromised intestinal mucous membranes, and a weakened bacterial colony. Restoration of the intestinal mucosa should include acid-base balance to reduce hyperacidity of the milieu, support digestive functions and promote healthy symbiotic bacterial colonies... Read the full article here. Save 10% when you Mix & Match 6 or more featured products with promo code. This potent and natural formula provides relief for hay fever or seasonal allergic rhinitis, and is a safe alternative to over the-counter anti-histamines. *Standardized to contain 12% catechins. Take two capsules two times a day with food or as directed by a health care practitioner. Allernest is a homeopathic combination for allergies and associated symptoms. Allernest works deep within the organism to reduce the hypersensitive reaction, stabilize histamine levels and has a positive influence on the skin, mucous membranes and airways. It reduces inflammation and swelling of the mucous membranes of the upper respiratory tract, strengthens the cell walls and decreases the hyper-allergic reaction. Allernest is also a powerful remedy for food and pet allergies and covers symptoms such as: coughing, sneezing, difficulty breathing, hay fever, rashes, itching of the skin, food reactions, and headaches. Take 10 drops in water three times daily before meals or to be used on the advice of a health care practitioner. Acute: Take 10 drops in water every 15 minutes until symptoms resolve. For Canadian orders only - for alternate products, see our application guide. US customers can contact marcopharma.com to purchase Nestmann products. Hydrastis Nasal Spray works by decreasing inflammatory processes in the nose, stimulates secretions, prevents drying out of the nasal mucosa, regenerates the function of the mucous membranes and normalizes nasal breathing. It is used for sinusitis, chronic rhinitis, allergies, ‘blocked’ or dry nose, pharyngolaryngitis, and nose bleeds. Take 1 to 2 sprays in each nostril* up to 5 times daily or to be used on the advice of a health care practitioner. *A mild burning sensation that may be felt for a few seconds after administration is harmless and helps to moisturize the nasal mucosa membranes. Luffa tabs are a traditional German preparation for sinusitis. This homeopathic combination is used for sinusitis, sinobronchitis and associated symptoms including chronic coryza with headache and accompanying bronchitis. It inhibits inflammation in the nose and paranasal sinus, decreases inflammation of lymphatic nodes and tonsils, and stabilizes the function of the sinubronchial complex. Luffa tabs also stimulate secretion of mucous, facilitate expectoration and inhibit inflammatory processes. In upper respiratory tract inflammation of an allergic origin, they work to decrease the inflammation of the mucous membranes (of the lungs, bronchi, and sinuses). Take 1 tablet and dissolve on the tongue three times daily or to be used on the advice of a health care practitioner. Acute: Take 1 tablet and dissolve on the tongue every hour until symptoms improve. Ester-C® is a patented form of vitamin C (calcium ascorbate) containing non-acidic mineral ascorbates and natural metabolites. Metabolites are powerful boosters that help the body to efficiently absorb vitamin C. Ester-C® has the ability to maximize vitamin C absorption with added Bioperine® (black pepper extract) to enhance bioavailability. Take one capsule a day or as directed by a health care practitioner. Ester-C® Premium is a unique combination of vitamin C in the form of Ester-C® and two well-known herbal antioxidants: green tea (Camilla sinensis) extract and grape seed (Vitis vinifera L.) extract. Ester-C® is a patented form of vitamin C (calcium ascorbate) containing non-acidic mineral ascorbates and natural metabolites, boosting the body’s efficiency to absorb vitamin C. Ester-C® has the ability to maximize vitamin C absorption with added Bioperine® (black pepper extract) to enhance bioavailability. Take one capsules a day with food or as directed by a health care practitioner. C Boost is a Food Nutrient formula designed for high bioavailability, assimilation and absorption. This unique form of vitamin C contains all nutrient coefficients (carbs, proteins, lipids, enzymes, glycol & lipoproteins, bioflavonoids, fatty acids and amino acids) to create a complete food matrix molecule, fully recognized and absorbed by the body as food. Studies show it is 148% more bioavailable than USP ascorbic acid. Human studies show that the Food Nutrient vitamin C found in C Boost has higher plasma and RBC absorption than ascorbic acid alone. This is backed by decades of clinical research by Dr. Albert Szent-Gyorgyi (1937 Nobel Price for Medicine for the first isolate vitamin C and biological oxidation in the Kreb’s Citric Acid Cycle) and Dr. Andy Szalay who created and perfected the Food Nutrient line of whole food matrix supplements. Mix 1 scoop (1.5 tsp) with 125 ml of water. Once per day. Probiotic 7-in-1 has been uniquely designed to incorporate seven different strains of healthy bacteria. The blend of Lactobacilli, Lactococci, Streptococci, and Bifidobacteria probiotics produce a broad spectrum approach to populate the small intestine through to the colon, thus balancing the entire intestinal flora. Since the beneficial probiotic effect is strain dependant, with each strain serving a specific inhibition purpose, this combination acts synergistically to control opportunistic (pathogenic) bacteria and support the body’s natural defense system. Our gut is home to trillions of microorganisms, with over 400 different species co-existing within the gastrointestinal tract. Beneficial bacteria are absolutely essential for life; with digestion of food, manufacturing and absorption of nutrients, detoxification, and the proper functioning of the highly evolved localized immune system dependant on them. Restoring a balanced intestinal flora with probiotics will lead to proper digestion, healthy gastrointestinal tract, regularity, and a strong immune system. The Institut Rosell, a pioneer in probiotic manufacturing, produces Probiotic 7-in-1 using specialized technology to ensure probiotic survival and biological activity. They have developed a shelf stable process which dramatically enhances the survival rate of probiotic bacteria at room temperature (therefore no refrigeration required) and strains of probiotics that resist the negative actions of oxygen, gastric acid, and bile salts, thereby ensuring balanced colonization of these strains throughout the ileum and colon. "Probiotic 7-in-1 is a product I love. Patients like the price and it works!" Take one to two capsules two times a day or as directed by a health care practitioner. Basictab supports the body in its ability to compensate for acid overload and achieve a pH balanced milieu. Tablet form allows for increased compliance in some patients. "Basictab is an effective, convenient and affordable alkalizing solution. Amazing." Take 2 to 4 tablets with warm water on an empty stomach (20 minutes before eating or 2 hours after eating) up to three times daily or as directed by a health care practitioner. Basic Powder supports the body in its ability to compensate for acid overload and achieve a pH balanced milieu. Adult: Take 1/2 to 1 teaspoon mixed with warm water on an empty stomach (20 minutes before eating or 2 hours after eating) up to three times daily or as directed by a health care practitioner. Sinus symptoms: Hydrastis Nasal Spray - 1-2 sprays up each nostril (max 5 times per day). Congestion: Luffa tabs - 1 tab dissolved under the tongue three times daily. Allerease - 10 2 caps twice a day with food. Vitamin C - take 2-4 grams twice daily within a 24 hour period. Allernest - take 3 tabs or 1 tsp twice daily in warm water on an empty stomach. Probiotic 7-in-1 - 1-2 sprays up each nostril (max 5 times per day). 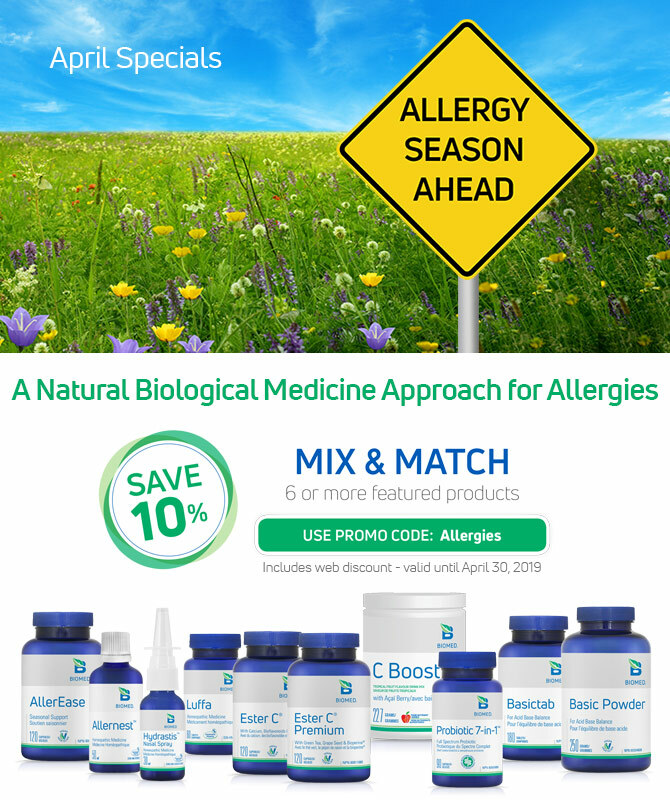 A Biological Medicine approach to allergies includes symptomatic relief with acidbase balance to reduce the hyperacidity and reactivity of the milieu and to support a healthy intestinal mucosa and immune system. Pleo-SANUVIS ointment 30g - Buy 2 Get 1 FREE! Pleo Sanuvis is L (+) lactic acid that is used to increase mitochondrial respiration, decrease lactic acid (-) build-up in the muscles and lower blood pH. It also supports treatment while using Pleo Muc (Mucokehl), by increasing Mucor racemosus activity. See Pleo Sanum Materia Medica for dosage.